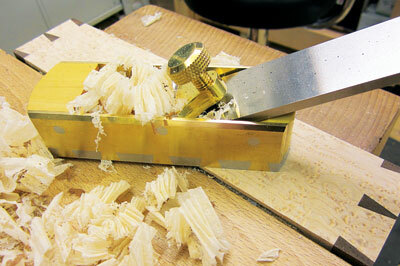 Regular readers will know that Karl Holtey has been working on a batch of small (No.10) mitre planes. I ordered one in boxwood (Buxus sempervirens) and my first impression was how pretty it was with perfectly rounded ends and long snecked iron. There's no adjuster and not only does it look better for it, it's easier also to adjust. The combination of lever cap and sneck allows the blade to be tapped up as well as down. This version differs from the one featured in the recent series in F&C in that the blade does not rest on the infill but on a brass button milled in perfect alignment with the mouth (see Karl's blog). The button passes through the rear infill and is partially submerged in the stainless steel sole, therefore not affected by movement in the wood. 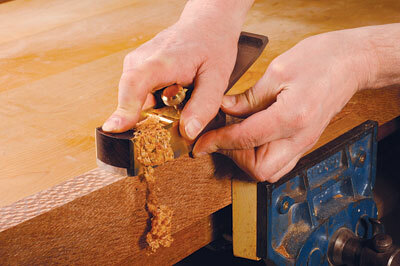 In practice this means the screw requires very little pressure to clamp the blade securely. The fit and finish are immaculate and the thick stainless steel sole adds some real weight. The A2 blade is superbly finished and required very little time to flatten the back. The bevel was ground to a low angle that made honing the tip to my preferred 30° very quick. The mouth opening is extremely tight, about three thou so I'm told. I've always found this to be very helpful in taking fine shavings and reducing tearout, although I know Karl disagrees. The bed angle is 25° which added to the 30° bevel gives an angle of attack of 55°. This is not dissimilar to the Holtey 11S high angle smoother bedded at 59°. I have one of these so was able to make a comparison. Combining stainless steel and brass with dovetails proved troublesome and took longer to produce than expected, resulting in a price just shy of£3,000. Karl is planning to make another batch in all stainless steel priced at £2,220. I tried planing some very difficult woods and both planes performed very well with little difference and near perfect results. The No.10 was surprisingly easier to use as it required much less effort and was more comfortable to hold. Karl describes it as a mitre/smoother and it certainly excels at smoothing. I used it to clean up the side of a box in birds-eye maple and it left a glass smooth surface. All in all, this is a cracking little plane and anyone buying one will not be disappointed. F&C followed the progress of this little plane for a few months and were happy to add a second opinion. Like David, we were also able to get some really fine shavings from some truly awkward timber and get excellent results. In short, the craftsmanship is unsurpassed but do not go on looks alone; it is made to be used.